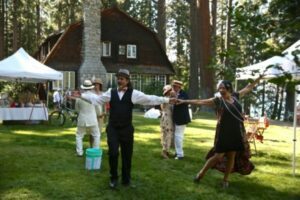 The Gatsby Festival is a two-day, Saturday & Sunday, event held each year the second weekend in August at the Pope-Baldwin Estates, Tallac Historic Site. NEW Friday Evening Kick-Off Event! Jazz Concert at the Boathouse Theatre. Exciting new programs, come celebrate the culture of the 1920’s. Congregate, relax and participate in the newly revitalized Gatsby Festival in Lake Tahoe. It’s looking better than ever! The Gatsby Festival is a free event for all ages, however fees do apply for specific tours, ticketed events and vendors throughout the festival. 1920’s attire is encouraged but not required. Guided Tours, Vintage Automobiles, Historical Talks, Period Clothing and Jewelery Vendors, Family Games & Activities, Food & Drink and so much more! Bring the whole family and come spend the day at these fabulous historic estates right on the shores of Lake Tahoe!